When it comes to choosing the right deck, it is a bit more complicated than just wood or low maintenance (though that is no easy decision). Let’s just say you choose wood decking. You are still far from done. When it comes to wood decking alone, you have to choose between pressure treated pine, Ipe, and western red cedar decking. And don’t get us started about deck design. That is a whole other topic. So, back to deck material: how do you choose? Which makes the most sense for you and your home? Just like anything in life, each wood decking material has its up and downs, or pros and cons if you will. Pine typically costs less than cedar, which is one reason it is so popular. However, not all pressure treated lumber is created equal. If you choose pine, you must be sure you are getting “choice,” “premium” or “select” treated boards. Cheap pressure treated lumber is full of moisture and can shrink unevenly and even twist when it dries, leaving your deck looking worse for wear. Durability: Pine is incredibly durable and will last for a long, long time. And when it comes to making a major investment, longevity matters. Rot Resistant: Cedar is naturally resistant to rot, which is a huge plus. Durability: Cedar doesn’t readily absorb moisture, which is the primary cause of twisting and splitting. Most cedar decks have a typical lifespan of 15-20 years. With an average return on investment (ROI) of 87%, according to Remodeling Magazine’s annual Cost vs. Value Report, a new wood deck is easily one of the best ways to add value to your home, no matter which material you choose. Looking for a Baltimore Deck Builder? 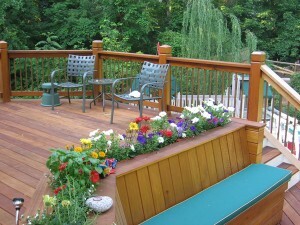 Mid- Atlantic Deck and Fence has been building custom decks in and around Baltimore, Maryland since 1987. We can help make your decking dreams a reality! We even use a 3D deck design software program to show you what your new deck will look like on your home. It doesn’t get much better than that.